Lessons Learned from a Trench of Loss. Some of you may know that I experienced another miscarriage in March. I was 17 weeks. 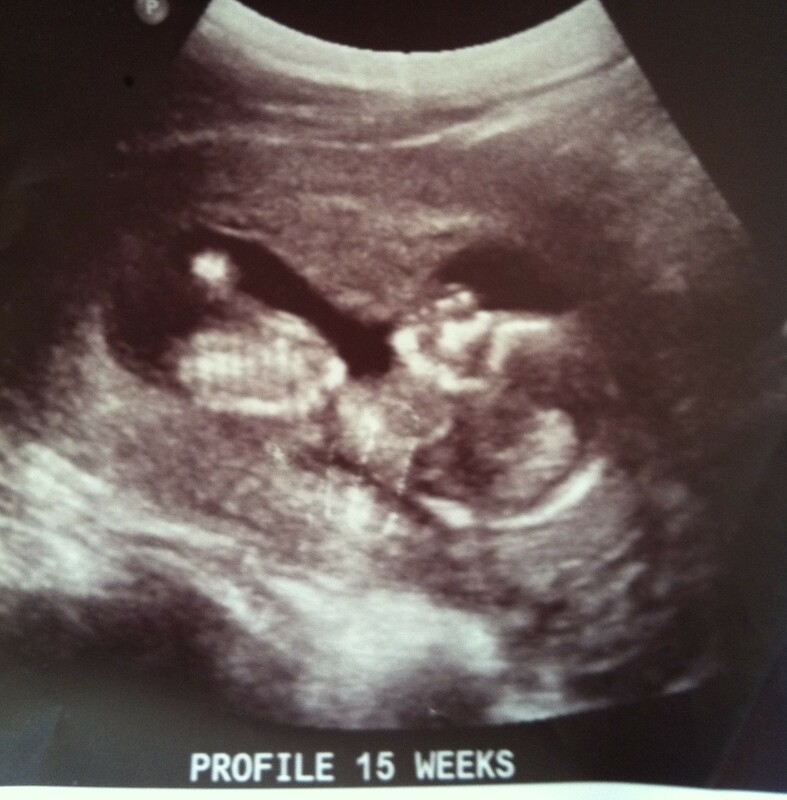 Here is a photo of our little baby at our 15 week ultrasound, apparently healthy and kicking 🙂 Sadly, two weeks later, I learned she had passed away. The private side of me wants to keep all this experience to myself. However, I have a strong conviction to share the story. It’s really been a bad-news/good-news situation. 1. My former trials are my resources to deal with today’s trials. Heartaches from years ago have clearly become redeemed, because they prepared me to shoulder this. Those hardships laid today’s foundation of perspective and strength, and if nothing else, isn’t that evidence that the Romans 8:28 promise is true? 2. Some people chose to say nothing, presumably because they thought it was nicer. One thing I quickly learned about myself: I felt most consoled when people expressed their sympathies. Acknowledgement gives dignity to the grief, and it honors the life that was lost. I took it pretty hard when friends and family chose silence; I had to choose forgiveness with Proverbs 14:10 in mind. Has anyone preferred for people to say nothing? I am asking with honest sincerity. If ever I have been, I won’t be a nothing-sayer again. Proverbs 12:25 says “An anxious heart weighs a man down, but a kind word cheers him up. “ How. True. 3. Memorized scripture passages were invaluable. Often I am not near my Bible (and using my Bible app makes the kids think I am looking my phone constantly). Calling on memorized passages drowns out the confusion, the lies of fear, the “what ifs,” and the inner voices of discouragement and defeat. You can’t think two thoughts at the same time. 4. God is LOVE. Love is the beginning of the story of humanity. Love is why we were created. Love is also why we all cower at the pain (evil) around us–we are not wired to simply shrug it off. Here in the land of the living, Love ALWAYS costs grief. But take heart, Love has the last word, and one day everything sad will come untrue. John 16:33. 5. Among the many strong women surrounding me, there has been tremendous suffering. I am humbled. 6. The social media do not give me a soul-fix. It usually brought me a few steps back in my progress. Great tools, horrible therapy. 7. Caving to fear will keep me from experiencing life to the fullest. 8. The name Gabrielle means “God will strengthen.” Raphael means “God Heals.” When this came to me, I knew our baby was named. It was my confirmation that the Lord does know the unborn, that Psalm 139:14-16 is true. He knows. 9. The gift of fertility is not something to fear, take for granted, or dismiss. See it as an honor and an opportunity, don’t necessarily turn it down. After almost 8 years, my husband and I can already see the evidence that each of our children are prestigious Godsends. Granted, having (more) children requires a step of faith, because it feels safer to maintain the status quo. But you only live once, and though it’s a tireless adventure, we’re after the richest experience–which entails taking the good with the bad. Thanks for letting me share these thoughts. ← Stop Chopping Onions Every Night. I love you. I’m so sorry that this time has been so guy wrenching and hard. I miss that little one already. You are so bold to share these lessons learned. Rily. Thank you. She brought us a lot of joy while we had her. Thank you for your kind compliments, and mostly for your help, generosity and support while we walked through this. I feel your loss! I have lost one baby, Angel, and had a blighted ovum. Though my loss was early, 8 to 10 weeks, I understand what you are feeling! I completely agree with you on all your statements. We cannot always understand Gods reason but they are what they are! You will reach some other lady that is not coping as well with her loss abd give her comfort and strength! Thank you for posting this! The well of sadness runs deep and long. My little lost one who never saw the light would have been 30 this year. I do think of the “might of been” in this life, but know with certainty I will recognize her in the next. May you find comfort in knowing He understands what it is to lose a precious Child and will continue to hold you up. Busy, but the loss is greater. I am happy you have found strength in The Lord, and only hoe my sister could do the same. God bless, may He who is in control and who knows what has to happen, grant you a health child if it is His desire. I am so sorry for your family’s loss. I will pray for your sweet sister to heal beautifully. We all heal in different amounts of time, and I hope she feels okay about that. Also, I know from other experiences, emotional reactions can be unpredictable. We don’t exactly know HOW we will respond to our tragedies. Dealing with the reaction itself can be a trial. I am so sorry for the loss of your little girl. I recently ran across something John Piper wrote to a mother who had lost a baby. Thirty four years after our little Katie “skipped Earth for Heaven” it had alot to say to me personally. Everyone’s grief is personal and on their individual time table. He is sovereign. Your story and Katie’s life impacted me tremendously this spring. You are such a beautiful example to me. Your friendship ministered to me over and over. I am no longer hurting as I was (grace) thanks to your kindnesses and your listening ear. This whole community has demonstrated so much love I can’t ever repay. I am blessed. Love you friend! I’m so sorry for your loss. I feel like a lot of times when something tragic happens I know there’s nothing I can say to make it better, and that’s why I may choose to be silent. You never know how words can make a difference though. Thanks for the feedback. I know nothing that people say can change the circumstances, but the acknowledgement, (for me) was soothing in that I felt that my sorrow was validated. Believe it or not, I was feeling guilty for feeling so bad about it. (Because people have suffered so much worse). I don’t want to be easily offendable. I know people come from a place of good will. My heart also aches for you and your family. I continue to pray for all of you. Thank you for sharing your story, it truly is encouraging in faith and you never know how your words may help others. God Bless! Thank you Jessica, your support, behind-the-scences prayer ,and words of kindness were very helpful. I am so glad we have another “chance” to be friends next year, It is making my transition to the next thing so much easier –:) We can be gym partners hopefully! I am so very sorry for your loss. I just brought our baby home who was in the NICU with life-threatening breathing issues (after a pregnancy where I had my own life-threatening issues), and feel like it’s going to take me a while to completely heal from that experience. Thank you so much for sharing what you’ve learned from your own tragedy. It is very helpful! Thank you for your sweet comments. I am so glad you and your sweet baby are doing better. I know for me, this whole experience has really underscored the fragility of life, and that the three children I do have are truly miracles. I hope that the feelings of fear and disappointment with your situation fade fast. I just checked out your awesome blog, I can’t wait to spend time reading more!! I am very interested in NFP and I am looking forward to learning more, I will be using your site as a resource! Can a post about sorrow and loss be lovely? And yet somehow that is the word that comes to mind to describe this blog entry. I especially will recall the line that you can’t have two thoughts at the same time. Plenty to reflect on there. 🙂 We have been calling it the ugly-beautiful (taken from Ann Voskamp’s 1,000 gifts book). Gleaning more clarity and deeper thanksgiving in the face of something so sad. I was just sharing this with my dear friend, who is also bereaved in this same way. Our unborn babies are truly messengers in so many ways. I personally, have learned a lot about myself, life, grief, and even other people by walking through this. I have had to really focus to appreciate the fact that these messages are gifts (of God) from the baby. Here is a rather personal example of one of those precious realizations. I realized I’ve had had little sympathy for people who become so out of shape. Until now. I have really found that my strength as well as motivation has diminished tremendously over this past 6 months–and I get it now. I don’t know what people have gone through, but emotional pain, fear, as well as loss/disappointment can completely obliterate any desire to exercise. Before all this happened, I really just thought that you have to rise above that “laziness”. I will never think that way again, I am thankful to have a more sympathetic view and far less judgmental. I just found your blog when searching for “paleo chicken casseroles” and this post made me cry. Thank you for reminding me to say something. I tend to be someone who remains silent, not knowing what to say. So I want you to know that I am sorry for your loss. I also agree with the value of using our minds. I always told my students to memorize – a seemingly lost art except for rap lyrics – whether it is scripture, Shakespeare, Whitman, or a hymn or other song to help them through the tough times they may face. I’ll never know if they will do this,but “Hope is a thing with feathers – That perches in the soul.” I do know that one student from my last year of teaching will always remember Emerson: When it is darkest, men (and women) can see the stars.” May we all have a light in our darkness. Thank you for your kind words. I am still healing from the disappointment in all this. I am surprised at how sad this whole thing has been, and I feel like I am just now out of the woods…where it really feels like its in the past! The idea “you cant think two thoughts at the same time” has been so helpful. But that is a discipline…a practice. And, as we know, LIGHT always pierces the darkness…not the other way around. 🙂 Thanks for reading and for speaking to me! Thanks for sharing, Dee. I am sorry for your losses. I don’t suppose the pain ever goes away permanently. I am doing much better, thank you for praying for me! It’s hard to believe it’s been about a year. Time is flying but the pain can be RIGHT there. I am thankful that we will meet our unknown babies in the world to come. And that we will know them in perfection. I think one of the lessons learned for me in the time that has passed since I lost that baby–is not to compare my family size/spacing to others around me. Each of us has had a very different childbearing journey..